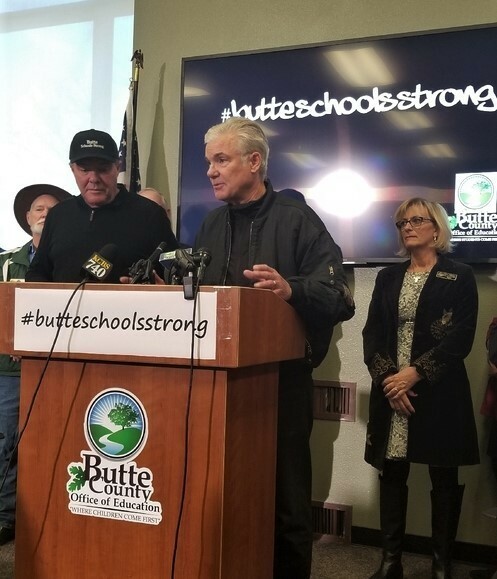 SACRAMENTO—State Superintendent of Public Instruction Tom Torlakson and Superintendent-elect Tony Thurmond praised Butte County school leaders and community members for working selflessly and heroically so that their students could return to school on Monday, December 3, less than a month after the worst fire in California history. Fourteen schools were damaged or destroyed during the Camp Fire and all 99 schools in Butte County were closed since the fire began, displacing 31,670 students. “The reopening of schools in Butte County so soon after this terrible tragedy provides a bright ray of hope. It shows the resilience and determination of school leaders and community members, and the generosity and kindness of so many people who gave and continue to give,” said Torlakson. State Superintendent-elect Tony Thurmond agreed, saying: “This shows that Butte County educators and their communities are continuing to put their passion, priority, and commitment toward helping their students. Today, 87 schools with about 28,032 students will return to their school of origin. Students from nine schools with an enrollment of about 2,208 will be housed at temporary school sites. Students in grades 7–12 with a total enrollment of 1,520 will be provided independent study on a temporary basis. The Camp Fire began on November 8 in the town of Pulga, and became the deadliest and most destructive fire in California history, burning 153,336 acres, destroying 14,000 residences, and killing at least 88 people. After the fire, Butte County educators, led by County Superintendent Tim Taylor, County Superintendent-elect Mary Sakuma, and leaders of all districts, including Paradise Unified School District Superintendent Michelle John and Oroville City Elementary School Superintendent Spencer Holtom, came together to work on a plan to return students to school as quickly as possible. Today, students from Paradise Elementary School, which was destroyed, will attend school at their new home, Bird Street Elementary School in the Oroville City Elementary School District. Students from Bird Street Elementary School have been moved to other Oroville schools. In addition, Durham Elementary School in Oroville, has opened up space on its campus allowing Ponderosa Elementary School in Paradise to be reconfigured. Students from Ponderosa will attend classes taught by their own teachers. Students from Concow, a community also devastated by the fire, will attend Spring Valley Elementary School in Oroville. Torlakson commended Oroville and all the communities in Butte County for opening their arms, their hearts, and their wallets to help their neighbors in need. Torlakson pledged that employees from the California Department of Education (CDE) will continue to do everything they can to help Butte County students and schools. Providing technical assistance in: early education, funding issues, legal issues, facilities, charter schools, special education, and after school programs. The Nutrition Services Division’s Food Distribution Program sent two truckloads of dry goods to the Salvation Army in Chico on November 16. This totaled 1,538 cases, weighed 60,866 pounds, and were valued at $37,489.34. The CDE coordinated an Executive Order signed by Governor Jerry Brown on November 28 to ensure students return to school quickly. It includes waivers for class size requirements, physical education, and residency. The CDE is working on a second Executive Order giving schools additional flexibility. The CDE and the Governor’s Office requested funds from the U.S. Department of Education for the Immediate Aid to Restart School Operations Program (Restart) and the Temporary Emergency Impact Aid for Displaced Students Program (Impact). Last year, California schools affected by the wildfires in October and December received $14 million from Restart funds and $3.5 million from Impact funds. Coordinating mental health and trauma support for teachers, students, staff and community members.